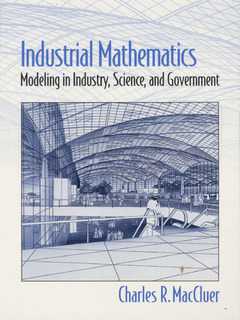 This book provides a concise, single-source survey of all the mathematics most useful in industry today-- particularly modeling and the unit $. Each chapter begins with a brief review of some relevant mathematics, then introduces the industrial extension of this same material via typical real-world applications. The power of interweaving analytic with computing methods during problem solving is demonstrated throughout and MATLAB code is integrated into the flow of the narrative. A chapter on Technical Writing--covering formal technical reports, memos, progress reports, executive summaries, problem statements, overhead projector presentations--shows how to best present mathematical data in a variety of situations. KEY TOPICS: Statistical Reasoning. Monte Carlo Methods. Data Acquisition and Manipulation. The Discrete Fourier Transform. Linear Programming. Regression. Cost Benefit Analysis. Microeconomics. Ordinary Differential Equations. Frequency Domain Methods. Partial Differential Equations. Divided Differences. Galerkin's Method. Splines. MARKET: A handbook or reference for Engineers, Project Managers, Mathematical Consultants, Statisticians for a quick study of mathematical issues that may arise in the workplace. (NOTE: Each chapter concludes with Exercises.) 1. Statistical Reasoning. Random Variables. Uniform Distributions. Gaussian Distributions. The Binomial Distribution. The Poisson Distribution. Taguchi Quality Control. 2. Monte Carlo Methods. Computing Integrals. Mean Time between Failure. Servicing Requests. The Newsboy Problem (reprise). 3. Data Acquisition and Manipulation. The z-transform. Linear Recursions. Filters. Stability. Polar and Bode Plots. Aliasing. Closing the Loop. Why Decibels? 4. The Discrete Fourier Transform. Real Time Processing. Properties of the DFT. Filter Design. The Fast Fourier Transform. Image Processing. 5. Linear Programming. Optimization. The Diet Problem. The Simplex Algorithm. 6. Regression. Best Fit to Discrete Data. Norms on R n. Hilbert Space. Grams Theorem on Regression. 7. Cost Benefit Analysis. Present Value. Life-Cycle Savings. 8. Microeconomics. Supply and Demand. Revenue, Cost, and Profit. Elasticity of Demand. Duopolistic Competition. Theory of Production. Leontiev Input/Output. 9. Ordinary Differential Equations. Separation of Variables. Mechanics. Linear ODEs with Constant Coefficients. Systems. 10. Frequency-Domain Methods. The Frequency Domain. Generalized Signals. Plants in Cascade. Surge Impedance. Stability. Filters. Feedback and Root Locus. Nyquist Analysis. Control. 11. Partial Differential Equations. Lumped versus Distributed. The Big Six PDEs. Separation of Variables. Unbounded Spatial Domains. Periodic Steady State. Other Distributed Models. 12. Divided Differences. Eulers Method. Systems. PDEs. Runge-Kutta Method. 13. Galerkins Method. Galerkins Requirement. Eigenvalue Problems. Steady Problems. Transient Problems. Finite Elements. Why So Effective? 14. Splines. Why Cubics? m-Splines. Cubic Splines. 15. Report Writing. The Formal Technical Report. The Memo. The Progress Report. The Executive Summary. The Problem Statement. Overhead Projector Presentations. Approaching a Writing Task. Style. Writers Checklist. References. Index.